5.2. Is Your Hardware Compatible? 9.3.1. Are You Unable to Boot With Your RAID Card? 9.3.6. Is Your RAM Not Being Recognized? 9.3.7. Is Your System Displaying Signal 11 Errors? 10.2. Is Your Hardware Compatible? 14.3.5. Is Your System Displaying Signal 11 Errors? 18.2.2. Is Your System Displaying Signal 11 Errors? 26.1. What are Kickstart Installations? 26.2. How Do You Perform a Kickstart Installation? 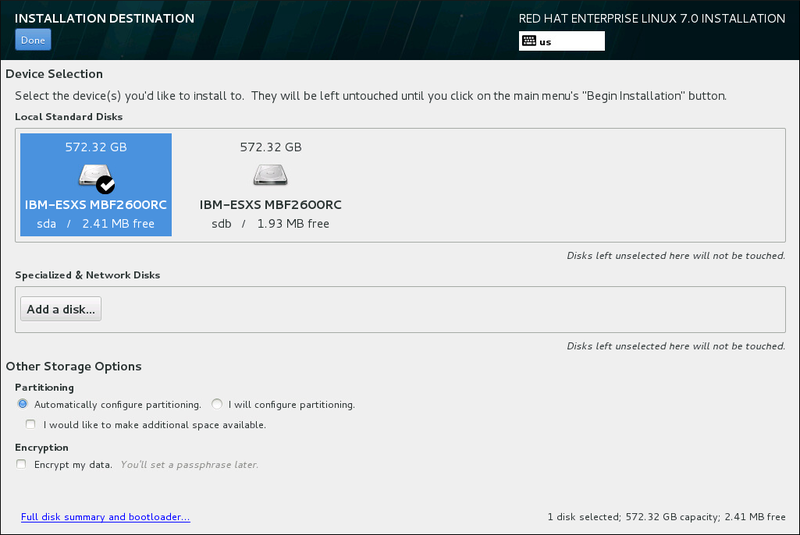 To select the disks and partition the storage space on which you will install Red Hat Enterprise Linux, select Installation Destination in the Installation Summary screen. If you are unfamiliar with disk partitions, see Appendix A, An Introduction to Disk Partitions for more information. Red Hat recommends that you always back up any data that you have on your systems. For example, if you are upgrading or creating a dual-boot system, you should back up any data you want to keep on your storage devices. Unforeseen circumstances can result in loss of all your data. If you have a RAID card, be aware that some BIOS types do not support booting from the RAID card. In such a case, the /boot partition must be created on a partition outside of the RAID array, such as on a separate hard drive. It is necessary to use an internal hard drive for partition creation with problematic RAID cards. A /boot partition is also necessary for software RAID setups. If you have chosen to automatically partition your system, you should manually edit your /boot partition; see Section 13.15.4, “Manual Partitioning” for more details. When you install Red Hat Enterprise Linux on a system with both multipath and non-multipath storage devices, the automatic partitioning layout in the installation program might create volume groups that contain a mix of multipath and non-multipath devices. This defeats the purpose of multipath storage. We advise that you select only multipath or only non-multipath devices on the Installation Destination screen. Alternatively, proceed to manual partitioning. On this screen, you can see storage devices available locally on your computer. You can also add additional specialized or network devices by clicking the Add a disk button. To learn more about these devices see Section 13.16, “Storage Devices”. If you do not feel comfortable with partitioning your system, leave the default selection of the Automatically configure partitioning radio button to let the installation program partition the storage devices for you. In the Partitioning section, you can select how storage devices are partitioned and how volumes are created. You can configure the partitions, manually or allow the installation program to do it automatically. Automatic partitioning is recommended if you are doing a clean installation on previously unused storage or do not need to keep any data that might be present on the storage. To proceed this way, leave the default selection of the Automatically configure partitioning radio button, and the installation program will create the necessary partitions and volumes on the storage space for you. You can click to the Red Hat Enterprise Linux software selection link. The link will navigate you to the Software selection section, where you can change what software you want to install, and free some aditional storage space. Alternatively, you can click Cancel & add more disks to return to the Installation Destination screen, where it is possible to add more storage devices or choose to configure partitioning manually. Click Reclaim space to free some storage space from existing file systems. See Section 13.15.3, “Reclaim Disk Space” for details. The second dialog appears if you cannot create enough free space. In this case, you have to add more disks on the initial storage screen or quit the installation. If you select the I will configure partitioning radio button for manual setup, you will be brought to the Manual Partitioning screen after clicking Done. See Section 13.15.4, “Manual Partitioning” for details. In the Encryption section, you can select the Encrypt my data check box to encrypt all partitions except for the /boot partition. See the Red Hat Enterprise Linux 7 Security Guide for information on encryption. At the bottom of the screen is the Full disk summary and bootloader button for you to configure a disk on which a boot loader will be installed. See Section 13.15.1, “Boot Loader Installation” for more information. Click the Done button once you have made your selections to either return to the Installation Summary screen or to proceed to the Manual Partitioning screen. Red Hat Enterprise Linux uses GRUB2 (GRand Unified Bootloader version 2) as its boot loader. The boot loader is the first program that runs when the computer starts and is responsible for loading and transferring control to an operating system. GRUB2 can boot any compatible operating system and can also use chain loading to transfer control to other boot loaders for unsupported operating systems. Installing GRUB2 can overwrite your existing boot loader. If you have other operating systems already installed, Red Hat Enterprise Linux attempts to automatically detect and configure GRUB2 to boot them. You can manually configure any additional operating systems if they are not detected properly. To specify which device the boot loader should be installed on, click the Full disk summary and bootloader link at the bottom of the Installation Destination screen. The Selected Disks dialog will appear. If you are partitioning the drive manually, this dialog can be reached by clicking Storage device/s selected on the Manual Partitioning screen. In the Boot column, a green tick icon marks one of the devices as the intended boot device. To change the boot device, select a device from the list and click the Set as Boot Device button to install the boot loader there instead. To decline installation of a new boot loader, select the marked device and click the Do not install bootloader button. This will remove the tick and ensure GRUB2 is not installed on any device. If you choose not to install a boot loader for any reason, you will not be able to boot the system directly, and you must use another boot method, such as a commercial boot loader application. Use this option only if you are sure you have another way to boot your system. If you selected the Encrypt my data option, when you click to proceed to the next screen the installation program will prompt you for a passphrase with which to encrypt the partitions on the system. Partitions are encrypted using the Linux Unified Key Setup - see the Red Hat Enterprise Linux 7 Security Guide for more information. Choose a passphrase and type it into each of the two fields in the dialog box. Note that you need to use the same keyboard layout for setting up this passphrase that you will use to unlock partitions later. Use the language layout icon to ensure the correct layout is selected. You must provide this passphrase every time that the system boots. Press Tab while in the Passphrase input field to retype it. If the passphrase is too weak, a warning icon appears in the field and you will not be allowed to type in the second field. Hover your mouse cursor over the warning icon to learn how to improve the passphrase. If you lose this passphrase, any encrypted partitions and the data on them will become completely inaccessible. There is no way to recover a lost passphrase. Note that if you perform a Kickstart installation, you can save encryption passphrases and create backup encryption passphrases during installation. See the Red Hat Enterprise Linux 7 Security Guide for more information about disk encryption. 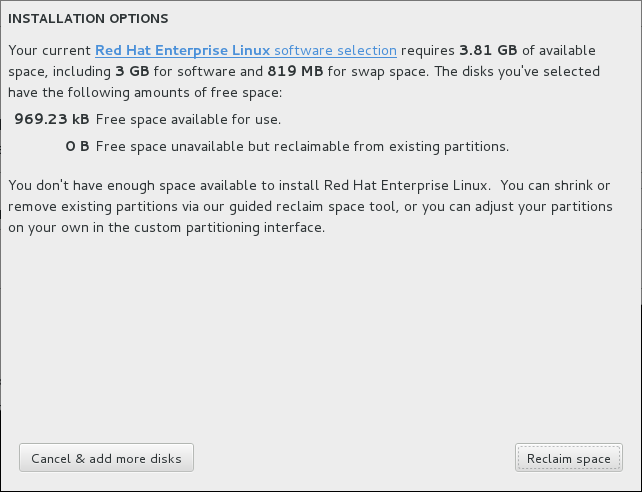 If there is insufficient space to install Red Hat Enterprise Linux on the disks selected in Installation Destination and you selected Reclaim Space at the Installation Options dialog, the Reclaim Disk Space dialog appears. Unless you select to shrink a partition, reclaiming space on a partition involves deleting all the data on it and you should always verify that any data you need to keep was backed up. The existing file systems Red Hat Enterprise Linux has detected are listed in a table as part of their respective disks. The Reclaimable Space column lists the space that could be reassigned to this installation. The Action column lists what action will be taken with the file system to reclaim space. Preserve - leaves the file system untouched and no data will be deleted. This is the default action. Delete - removes the file system entirely. All the space it takes up on the disk will be made available for the installation. Shrink - recovers free space from the file system and makes it available for this installation. Use the slider to set a new size for the selected partition. Can only be used on resizable partitions where LVM or RAID is not used. Delete all/Preserve all - this button, located on the right, marks all file systems for deletion by default. Upon clicking, it changes the label and allows you to mark all file systems to be preserved again. Select a file system or a whole disk in the table with your mouse and click one of the buttons. The label in the Action column will change to match your selection and the amount of Total selected space to reclaim displayed beneath the table will adjust accordingly. Beneath this value is the amount of space the installation requires based on the packages you have selected to install. When enough space has been reclaimed for the installation to proceed, the Reclaim Space button will become available. Click this button to return to the Installation Summary screen and proceed with the installation. The Manual Partitioning screen is displayed when you click Done from Installation Destination if you selected the I will configure partitioning option. On this screen you configure your disk partitions and mount points. This defines the file system that Red Hat Enterprise Linux will be installed on. The Manual Partitioning screen initially features a single pane on the left for the mount points. The pane is either empty except for information about creating mount points, or it displays existing mount points that the installation program has detected. These mount points are organized by detected operating system installations. Therefore, some file systems might be displayed multiple times if a partition is shared among several installations. The total space and available space on selected storage devices are displayed beneath this pane. If your system contains existing file systems, ensure that enough space will be available for the installation. Use the - button to remove unneeded partitions. For recommendations and additional information about disk partitions, see Appendix A, An Introduction to Disk Partitions and Section 13.15.4.4, “Recommended Partitioning Scheme”. At a bare minimum, you need an appropriately sized root partition, and usually a swap partition appropriate to the amount of RAM you have on your system. 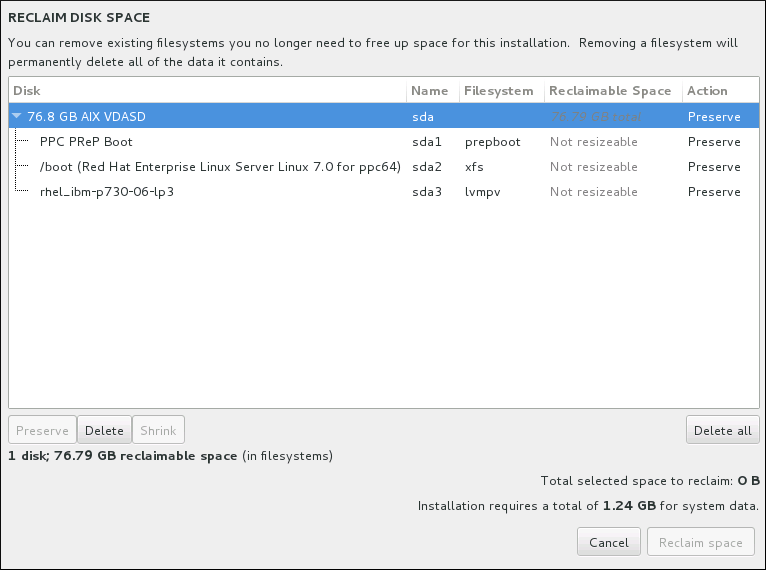 An installation of Red Hat Enterprise Linux requires a PReP boot partition and one other partition but Red Hat recommends at least five: PReP, /, /home, /boot, and swap. You can also create additional partitions you require. See Section 13.15.4.4, “Recommended Partitioning Scheme” for further details. If you have any specific requirements for some partitions (for example, requiring that a particular partition be on a specific disk) and less specific requirements for other partitions, create the partitions first which have more specific requirements. Adding a file system is a two-step process. You first create a mount point in a certain partitioning scheme. The mount point appears in the left pane. Next, you can customize it using the options in the right pane, where you can change the mount point, capacity, the device type, file system type, label, and whether to encrypt or reformat the corresponding partition. If you have no existing file systems and want the installation program to create the required file systems and their mount points for you, select your preferred partitioning scheme from the drop-down menu in the left pane (default for Red Hat Enterprise Linux is LVM), then click the link on top of the pane for creating mount points automatically. This will generate a /boot partition, a / (root) volume, and a swap volume proportionate to the size of the available storage. These are the recommended file systems for a typical installation, but you can add additional file systems and mount points if you need to. Alternatively, create individual mount points using the + button at the bottom of the pane. The Add a New Mount Point dialog then opens. Either select one of the preset paths from the Mount Point drop-down menu or type your own; for example, select / for the root partition or /boot for the boot partition. Then enter the size of the file system in the Desired Capacity text field; for example, 2GiB. If you leave the field empty or if you specify a size bigger than available space, all remaining free space is used instead. After entering these details, click the Add mount point button to create the partition. To avoid problems with space allocation, first create small partitions with known fixed sizes, such as /boot, and then create the rest of the partitions, letting the installation program allocate the remaining capacity to them. Similarly, if you have multiple disks that the system is to reside on, they differ in size, and a particular partition must be created on the first disk detected by BIOS, be sure to start by creating such a partition. For each new mount point you create manually, you can set its partitioning scheme from the drop-down menu located in the left pane. The available options are Standard Partition, BTRFS, LVM, and LVM Thin Provisioning. Note that the /boot partition will always be located on a standard partition, regardless of the value selected in this menu. To change on which devices a single non-LVM mount point should be located, select the mount point and click the Modify... button in the right pane to open the Configure Mount Point dialog. Select one or more devices and click Select. After the dialog closes, note that you also need to confirm this setting by clicking the Update Settings button on the right side of the Manual Partitioning screen. To refresh information about all local disks and partitions on them, click the Rescan button (with the circular arrow icon on it) in the toolbar. You only need to do this action after performing advanced partition configuration outside the installation program. 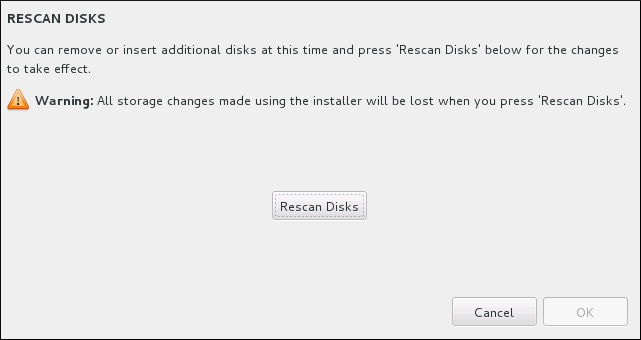 Note that if you click the Rescan Disks button, all configuration changes you previously made in the installation program will be lost. At the bottom of the screen, a link states how many storage devices have been selected in Installation Destination (see Section 13.15, “Installation Destination”). Clicking on this link opens the Selected Disks dialog, where you review the information about the disks. See Section 13.15.1, “Boot Loader Installation” for more information. Mount Point - enter the file system's mount point. For example, if a file system should be the root file system, enter /; enter /boot for the /boot file system, and so on. For a swap file system, the mount point should not be set - setting the file system type to swap is sufficient. Desired Capacity - enter the desired size of the file system. You can use common size units such as KiB or GiB. The default is MiB if no other unit is specified. Device type - choose one of these types: Standard Partition, LVM, RAID, LVM Thin Provisioning, or BTRFS. Check the adjacent Encrypt box to encrypt the partition or volume. You will be prompted to set a password later. RAID is only available if two or more disks are selected for partitioning, and if you choose this type, you can also set the RAID Level. Similarly, if you select LVM, you can specify the Volume Group. File system - in the drop-down menu, select the appropriate file system type for this partition or volume. Check the adjacent Reformat box to format an existing partition, or leave it unchecked to retain your data. Note that newly created partitions and volumes must be reformatted, and the check box cannot be unchecked in this case. Label - assign a label to the partition. Labels are used for you to easily recognize and address individual partitions. Name - assign a name to an LVM or Btrfs volume. 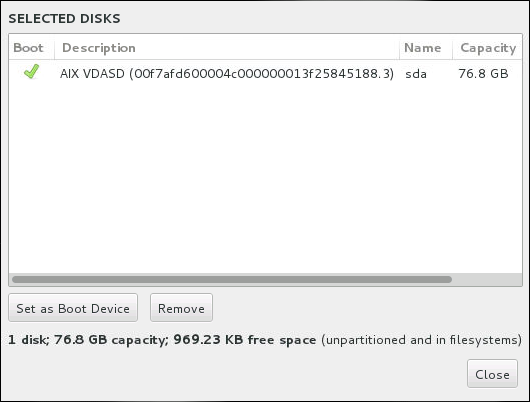 Note that standard partitions are named automatically when they are created and their name cannot be edited, such as /home being assigned the name sda1. See Section 13.15.4.1.1, “File System Types” for more information about file system and device types. Click the Update Settings button to save your changes and select another partition to customize. Note that the changes will not be applied until you actually start the installation from the Installation summary page. Click the Reset All button to discard all changes to all partitions and start over. When all file systems and mount points have been created and customized, click the Done button. If you chose to encrypt any file system, you will now be prompted to create a passphrase. Then, a dialog appears, showing a summary of all actions related to storage that the installation program will take. This includes creating, resizing, or deleting partitions and file systems. You can review all the changes and click Cancel & Return to Custom Partitioning to go back. To confirm your changes, click Accept Changes to return to the Installation Summary page. To partition additional devices, select them in the Installation Destination screen, return to the Manual Partitioning screen, repeat the steps outlined in this section for the additional devices. If /usr or /var is partitioned separately from the rest of the root volume, the boot process becomes much more complex because these directories contain components critical to it. In some situations, such as when these directories are placed on an iSCSI drive or an FCoE location, the system can either be unable to boot, or hang with a Device is busy error when powering off or rebooting. This limitation only applies to /usr or /var, not to directories below them. For example, a separate partition for /var/www will work without issues. Red Hat Enterprise Linux allows you to create different device types and file systems. The following is a brief description of the different device types and file systems available, and how they can be used. standard partition - A standard partition can contain a file system or swap space, or it can provide a container for software RAID or an LVM physical volume. logical volume (LVM) - Creating an LVM partition automatically generates an LVM logical volume. LVM can improve performance when using physical disks. For information on how to create a logical volume, see Section 13.15.4.3, “Create LVM Logical Volume”. For more information regarding LVM, see the Red Hat Enterprise Linux 7 Logical Volume Manager Administration guide. LVM thin provisioning - Using thin provisioning, you can manage a storage pool of free space, known as a thin pool, which can be allocated to an arbitrary number of devices when needed by applications. The thin pool can be expanded dynamically when needed for cost-effective allocation of storage space. For more information regarding LVM, see the Red Hat Enterprise Linux 7 Logical Volume Manager Administration guide. The installer will automatically reserve 20% of any requested space for an LVM thin pool logical volume in the volume group containing it. This is a safety measure to ensure that you can extend either the metadata volume or the data volume of your thinly provisioned logical volume. software RAID - Creating two or more software RAID partitions allows you to create a RAID device. One RAID partition is assigned to each disk on the system. To create a RAID device, see Section 13.15.4.2, “Create Software RAID”. For more information regarding RAID, see the Red Hat Enterprise Linux 7 Storage Administration Guide. xfs - XFS is a highly scalable, high-performance file system that supports file systems up to 16 EiB (approximately 16 billion GiB), files up to 8 EiB (approximately 8 billion GiB), and directory structures containing tens of millions of entries. XFS supports metadata journaling, which facilitates quicker crash recovery. The XFS file system can also be defragmented and resized while mounted and active. This file system is selected by default and is highly recommended. For information on how to translate common commands from previously used ext4 file system to XFS, see Appendix E, Reference Table for ext4 and XFS Commands. The maximum supported size of an XFS file system in Red Hat Enterprise Linux is currently 500 TiB. ext4 - The ext4 file system is based on the ext3 file system and features a number of improvements. These include support for larger file systems and larger files, faster and more efficient allocation of disk space, no limit on the number of subdirectories within a directory, faster file system checking, and more robust journaling. The maximum supported size of an ext4 file system in Red Hat Enterprise Linux is currently 50 TiB. ext3 - The ext3 file system is based on the ext2 file system and has one main advantage - journaling. Using a journaling file system reduces time spent recovering a file system after a crash as there is no need to check the file system for metadata consistency by running the fsck utility every time a crash occurs. ext2 - An ext2 file system supports standard Unix file types, including regular files, directories, or symbolic links. It provides the ability to assign long file names, up to 255 characters. vfat - The VFAT file system is a Linux file system that is compatible with Microsoft Windows long file names on the FAT file system. swap - Swap partitions are used to support virtual memory. In other words, data is written to a swap partition when there is not enough RAM to store the data your system is processing. PReP - this small boot partition is located on the first partition of the hard drive. The PReP boot partition contains the GRUB2 boot loader, which allows other IBM Power Systems servers to boot Red Hat Enterprise Linux. Each file system has different size limits for the file system itself as well as individual files contained within. 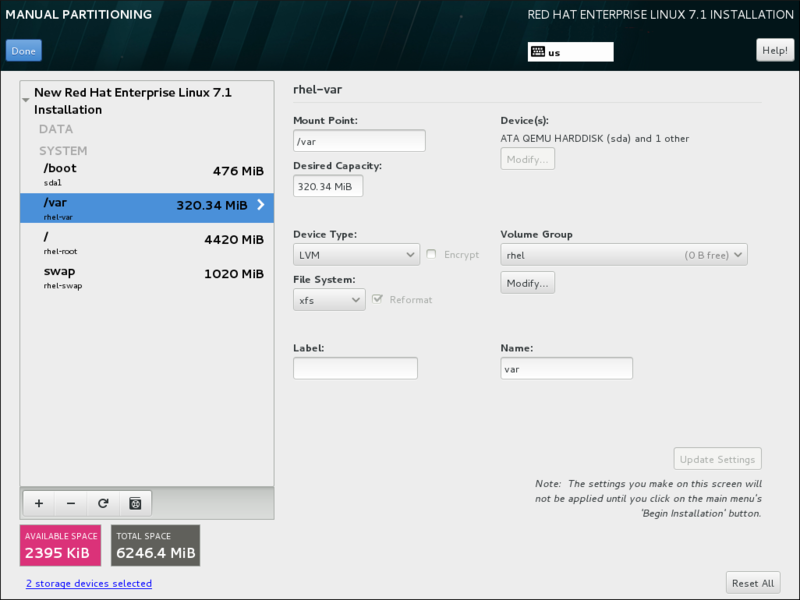 For a list of maximum supported file and file system sizes, see the Red Hat Enterprise Linux technology capabilities and limits page, available on the Customer Portal at https://access.redhat.com/site/articles/rhel-limits. Redundant arrays of independent disks (RAIDs) are constructed from multiple storage devices that are arranged to provide increased performance and, in some configurations, greater fault tolerance. See below for a description of different kinds of RAIDs. A RAID device is created in one step and disks are added or removed as necessary. One RAID partition per physical disk is allowed for each device, so the number of disks available to the installation program determines which levels of RAID device are available to you. For example, if your system has two hard drives, the installation program will not allow you to create a RAID10 device, which requires 4 separate partitions. RAID configuration options are only visible if you have selected two or more disks for installation. 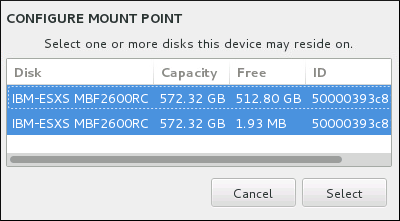 At least two disks are required to create a RAID device. Create a mount point as described in Section 13.15.4.1, “Adding File Systems and Configuring Partitions”. By configuring this mount point, you configure the RAID device. Keeping the partition selected in the left pane, select the configuration button below the pane to open the Configure Mount Point dialog. Select which disks will be included in the RAID device and click Select. Click the Device Type drop-down menu and select RAID. Click the File System drop-down menu and select your preferred file system type (see Section 8.14.4.1.1, “File System Types”. Click the RAID Level drop-down menu and select your preferred level of RAID. Distributes data across multiple disks. Level 0 RAIDs offer increased performance over standard partitions, and can be used to pool the storage of multiple disks into one large virtual device. Note that Level 0 RAIDs offer no redundancy, and that the failure of one device in the array destroys data in the entire array. RAID 0 requires at least two RAID partitions. Mirrors all data on one disk onto one or more other disks. Additional devices in the array provide increasing levels of redundancy. RAID 1 requires at least two RAID partitions. Distributes data across multiple disks, and uses one disk in the array to store parity information that safeguards the array in case any disk within the array fails. Because all parity information is stored on one disk, access to this disk creates a bottleneck in the performance of the array. RAID 4 requires at least three RAID partitions. Distributes data and parity information across multiple disks. Level 5 RAIDs therefore offer the performance advantages of distributing data across multiple disks, but do not share the performance bottleneck of level 4 RAIDs because the parity information is also distributed through the array. RAID 5 requires at least three RAID partitions. Level 6 RAIDs are similar to level 5 RAIDs, but instead of storing only one set of parity data, they store two sets. RAID 6 requires at least four RAID partitions. Level 10 RAIDs are nested RAIDs or hybrid RAIDs. They are constructed by distributing data over mirrored sets of disks. For example, a level 10 RAID array constructed from four RAID partitions consists of two mirrored pairs of striped partitions. RAID 10 requires at least four RAID partitions. Click Update Settings to save your changes, and either continue with another partition or click Done to return to the Installation Summary screen. If fewer disks are included than the specified RAID level requires, a message will be displayed at the bottom of the window, informing you how many disks are actually required for your selected configuration. Logical Volume Management (LVM) presents a simple logical view of underlying physical storage space, such as hard drives or LUNs. Partitions on physical storage are represented as physical volumes that can be grouped together into volume groups. Each volume group can be divided into multiple logical volumes, each of which is analogous to a standard disk partition. Therefore, LVM logical volumes function as partitions that can span multiple physical disks. To learn more about LVM, see Appendix C, Understanding LVM or read the Red Hat Enterprise Linux 7 Logical Volume Manager Administration guide. Note that LVM configuration is only available in the graphical installation program. During text-mode installation, LVM configuration is not available. If you need to create an LVM configuration from scratch, press Ctrl+Alt+F2 to use a different virtual console, and run the lvm command. To return to the text-mode installation, press Ctrl+Alt+F1. Create a mount point for the LVM volume as described in Section 13.15.4.1, “Adding File Systems and Configuring Partitions”. Click the Device Type drop-down menu and select LVM. The Volume Group drop-down menu appears and displays the newly-created volume group name. Optionally, either click the menu and select Create a new volume group or click Modify to configure the newly-created volume group, if you need to. Both the Create a new volume group option and the Modify button lead to the Configure Volume Group dialog, where you can rename the logical volume group and select which disks will be included. 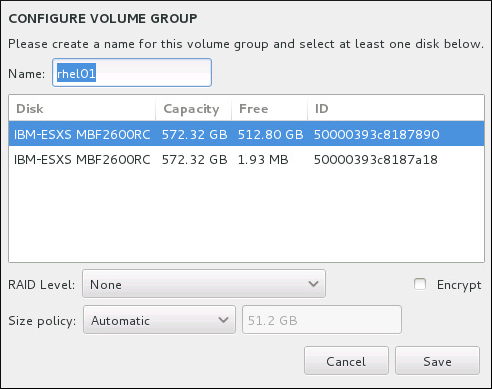 The configuration dialog does not allow you to specify the size of the volume group's physical extents. The size will always be set to the default value of 4 MiB. If you want to create a volume group with different physical extents, create it manually by switching to an interactive shell and using the vgcreate command, or use a Kickstart file with the volgroup --pesize=size command. Automatic - the size of the volume group is set automatically so that it is just large enough to contain the configured logical volumes. This is optimal if you do not need free space within the volume group. As large as possible - the volume group is created with maximum size, regardless of the size of the configured logical volumes it contains. This is optimal if you plan to keep most of your data on LVM and later need to increase the size of some existing logical volumes, or if you need to create additional logical volumes within this group. Fixed - with this option, you can set an exact size of the volume group. Any configured logical volumes must then fit within this fixed size. This is useful if you know exactly how large you would like the volume group to be. Click Save when the group is configured. Placing the /boot partition on an LVM volume is not supported. The first partition of the hard drive should include a PReP boot partition. This contains the GRUB2 boot loader, which allows other IBM Power Systems servers to boot Red Hat Enterprise Linux. The partition mounted on /boot contains the operating system kernel, which allows your system to boot Red Hat Enterprise Linux, along with files used during the bootstrap process. Due to the limitations of most firmwares, creating a small partition to hold these is recommended. In most scenarios, a 1 GiB boot partition is adequate. Unlike other mount points, using an LVM volume for /boot is not possible - /boot must be located on a separate disk partition. If you have a RAID card, be aware that some BIOS types do not support booting from the RAID card. In such a case, the /boot partition must be created on a partition outside of the RAID array, such as on a separate hard drive. If you have a RAID card, be aware that Red Hat Enterprise Linux does not support setting up hardware RAID on an IPR card. You can boot the standalone diagnostics CD prior to installation to create a RAID array and then install to that RAID array. This is where "/", or the root directory, is located. The root directory is the top-level of the directory structure. By default, all files are written to this file system unless a different file system is mounted in the path being written to (for example, /boot or /home). While a 5 GiB root file system allows you to install a minimal installation, it is recommended to allocate at least 10 GiB so that you can install as many package groups as you want. Do not confuse the / directory with the /root directory. The /root directory is the home directory of the root user. The /root directory is sometimes referred to as slash root to distinguish it from the root directory. To store user data separately from system data, create a dedicated file system for the /home directory. This file system should be sized based on the amount of data that will be stored locally, number of users, and so on. 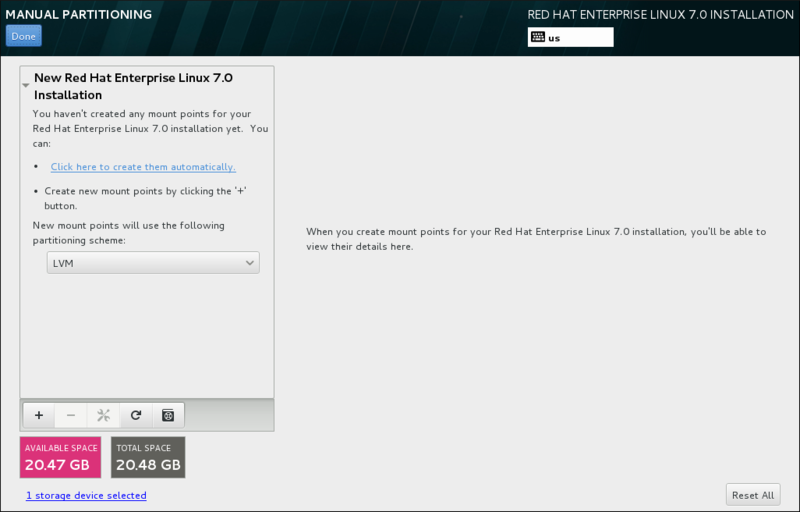 This will enable you to upgrade or reinstall Red Hat Enterprise Linux without erasing user data files. If you select automatic partitioning, it is recommended to have at least 55GiB of disk space available for the installation, to ensure that the /home file system is created. Swap file systems support virtual memory; data is written to a swap file system when there is not enough RAM to store the data your system is processing. Swap size is a function of system memory workload, not total system memory and therefore is not equal to the total system memory size. Therefore, it is important to analyze what applications a system will be running and the load those applications will serve in order to determine the system memory workload. Application providers and developers should be able to provide some guidance. When the system runs out of swap space, the kernel terminates processes as the system RAM memory is exhausted. Configuring too much swap space results in storage devices being allocated but idle and is a poor use of resources. Too much swap space can also hide memory leaks. The maximum size for a swap partition and other additional information can be found in the mkswap(8) manual page. The following table provides the recommended size of a swap partition depending on the amount of RAM in your system. If you let the installation program partition your system automatically, the swap partition size will be established using these guidelines. Automatic partitioning setup assumes that the maximum size of the swap partition is limited to 10% of the total size of the hard drive, and the installer cannot create swap partitions more than 128GB in size. If you want to set the swap partition size to more than 10% of the system's storage space, or more than 128GB, you must edit the partitioning layout manually. At the border between each range listed above (for example, a system with 2 GB, 8 GB, or 64 GB of system RAM), discretion can be exercised with regard to chosen swap space. If your system resources allow for it, increasing the swap space can lead to better performance. Distributing swap space over multiple storage devices - particularly on systems with fast drives, controllers and interfaces - also improves swap space performance. The PackageKit update software downloads updated packages to /var/cache/yum/ by default. If you create a separate partition or volume for /var, ensure that it is at least 3GB in size to accommodate downloaded package updates.